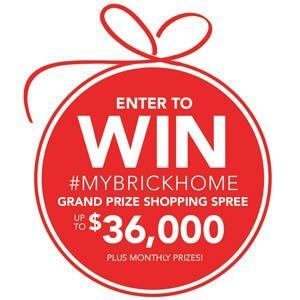 Contest: The Brick - win a shopping spree to furnish your entire home (up to $36,000)! The Brick - win a shopping spree to furnish your entire home (up to $36,000)! Prize: Enter for a chance to win a monthly(13 prizes) $1,500 Brick gift card, plus our grand prize draw for a chance to win a shopping spree to furnish your entire home (up to $36,000)! Statistics: This contest was opened by 191 and entered by 4 ContestChest.com members. 2% of those who opened the contest, entered it.